Massachusetts already bans texting while driving, but advocates say motorists are still distracted when holding a phone to their ear. Governor Charlie Baker on Tuesday proposed banning hand-held cellphone use while driving, a long-debated proposal that has stalled in Massachusetts even as other states in New England and around the country have adopted similar bans. A sweeping roadway safety bill filed by Baker on Tuesday is the latest salvo in the bid to crack down on distracted driving. Under the law, motorists would instead be required to use a Bluetooth connection or other technology to talk hands-free while driving. Previous efforts to prohibit hand-held use of phones have failed to become law several times in recent years — even though public opinion polling shows widespread support for banning hand-held phones. More than a dozen other states, including all those bordering Massachusetts, have enacted similar bans. But Stacy Thompson, director of the Livable Streets Alliance, a transportation advocacy group, said the effort this time might succeed because Baker is pushing for it. 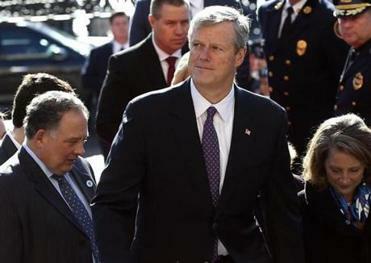 Governor Charlie Baker is slated Wednesday to unveil his budget plan for fiscal year 2020 and his much-anticipated take on overhauling the state’s 26-year-old school funding formula. Baker is in some ways an unlikely champion for the ban, having opposed previous efforts to outlaw hand-held phone use while driving. But in late 2017 he changed his tone, saying hands-free technology had become more affordable and distracted driving was a safety issue, while endorsing a proposal before the Legislature at the time. Now he is expected to speak in support of the bill at an event being held by activists at the State House Wednesday. Massachusetts already bans texting while driving for all drivers, and prohibits drivers under the age of 18 from using cellphones at all. But advocates say that even talking on a device held to your ear while driving can be a distraction. 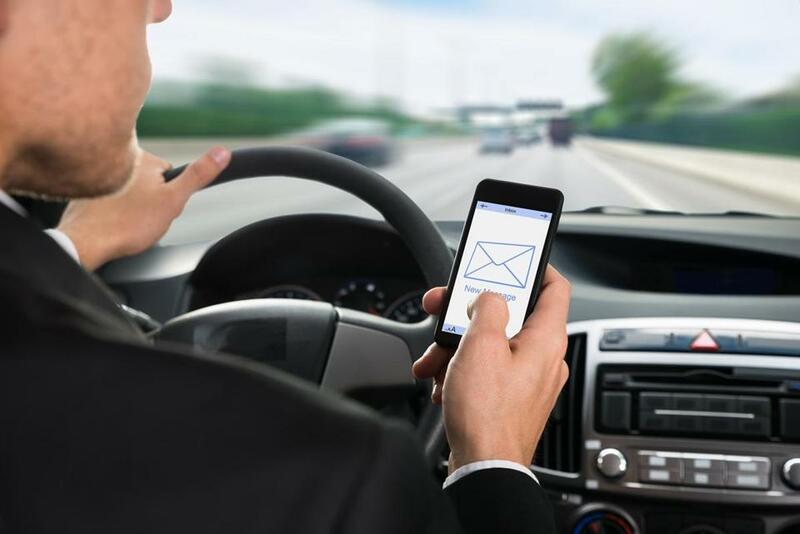 Moreover, law enforcement officials say the texting ban is insufficient, because drivers caught looking at their phones can say they were merely dialing a number — which is still allowed by state law. Under Baker’s bill, drivers could not touch electronic devices for any purpose other than “a single tap or swipe to activate, deactivate, or initiate hands-free mode.” A first offense would carry a $100 fine, a second offense would be $250, and all subsequent offenses would be $500 if incurred within six years of the first offense. The third offense would also trigger an insurance surcharge. Drivers could use a dashboard mount to display maps and other navigation apps, although Baker’s proposal would not allow drivers to enter an address into the app while operating the vehicle. The governor’s plan would allow drivers to use their phones in emergencies. But the proposal does not address the sticking point that has prevented it from moving forward in recent years: concerns that racial minorities would be unfairly targeted by police. Former state representative Byron Rushing, who was a member of House leadership, opposed earlier versions of the proposals because he said they lacked requirements that police collect data about traffic enforcement to detect for potential bias. For similar reasons, Rushing long opposed allowing police to pull drivers over for not wearing a seat belt — but Baker’s new bill would give police that power. Police today can ticket drivers for not using a seat belt, but only if they’ve already been pulled over for something else. Rushing lost a primary last fall and was not reelected to the Legislature. But the same concerns could be an issue for the bill this time around, said Emily Stein, president of the Safe Roads Alliance, an advocacy group that has long pushed for the ban and is considering putting the issue to voters as a ballot question. She called for negotiations among police, activists, and lawmakers to ensure the hands-free ban passes with provisions that would protect minorities. House Speaker Robert DeLeo’s office would say only that Baker’s proposal would be taken under consideration. The state Senate has passed cellphone bans in each of the last two sessions, including one version that required data collection. Baker’s bill would also allow electric scooter rentals — a form of transportation that has not taken hold here — to operate on Massachusetts roads, by clearing up language in state law that officials in Boston, Cambridge, and Somerville believe makes them illegal because they do not have directional signals. Baker would essentially regulate the scooters as bicycles, instead of as motorized vehicles, and they would not need blinkers. Helmets would be required of any rider age 16 and under. That approach is in stark contrast to another scooter bill filed in the Legislature that would impose more stringent oversight and regulate scooters more like ride-hailing services, including by charging a fee for each ride. Boston Transportation Commissioner Gina Fiandaca declined to comment on Baker’s bill to legalize scooters but said Mayor Martin J. Walsh hopes to allow them on the city’s streets as soon as this spring. Baker’s transportation proposal also includes a provision to amend drunken driving laws, recommending that first-time offenders who apply for a temporary hardship license be required to have an ignition interlock device that tests for alcohol use in their cars for six months. Baker also wants all trucks owned by the state government to install sideguards that would protect cyclists during a crash.